WASHINGTON (CNN) -- Defense Secretary Robert Gates has asked Pentagon staff to draw up plans for shutting the U.S. prison camp at Guantanamo Bay, Cuba, a Pentagon spokesman said. 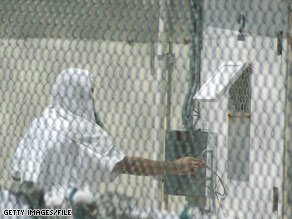 A detainee is seen through a fence in July at the U.S. prison camp at Guantanamo Bay, Cuba. The camp holds about 250 suspected terrorists, down from a peak of roughly 750 men from 40 countries. It houses several top al Qaeda figures, including Khalid Sheikh Mohammed -- the confessed architect of the September 11, 2001, attacks. Gates "has asked his team for a proposal on how to shut it down, what would be required specifically to close it and move the detainees from that facility, while at the same time, of course, ensuring that we protect the American people [from] some very dangerous characters," Pentagon press secretary Geoff Morrell said Thursday. Morrell described it as a contingency plan in case the new administration wants to take it up early in the new year. President-elect Barack Obama has pledged to close the camp at Guantanamo but hasn't set a specific timetable. Gates will continue as defense secretary when Obama takes office. "I would like to see it closed," Gates told Charlie Rose in a PBS interview. "And I think it will be a high priority for the new administration." Officials close to the Obama team said in November that the incoming administration is pondering options, including trying some of the Guantanamo Bay inmates in federal courts, setting up a special national security court to deal with cases involving the most sensitive intelligence information, and releasing some inmates. In an October 31 interview with CNN, Obama said only that he would close the facility "as quickly as we can do prudently." "I am not going to give a time certain because I think what we have to do is evaluate all those who are still being held in Gitmo," he said. "We have to put in place appropriate plans to make sure they are tried, convicted and punished to the full extent of the law, and that's going to require, I think, a review of the existing cases, which I have not had the opportunity to do." In May, Gates told a Senate committee that efforts to shut down the facility were "stuck" over what to do with the inmates.